SurgicalPerformance is all about measuring and comparing. 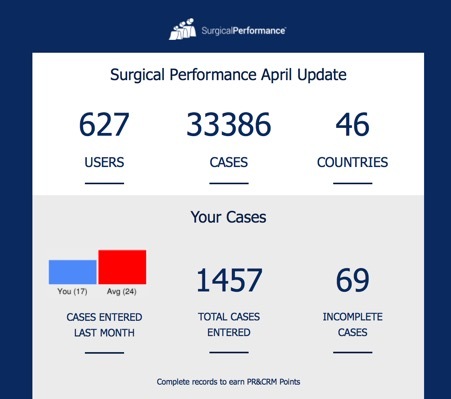 On the last day of each calender month, every SurgicalPerformance user receives an update on the user’s audit activity. We are transparent and share with you the total number of SurgicalPerformance users as well as the total number of cases that are available for benchmarking. In addition, your Monthly Update will inform our users individually how many cases the user entered during the last month and how that compares to the average during that month. We also send you the total number of cases that are saved under your account, and the number of incomplete cases that require one or more data to complete the record.